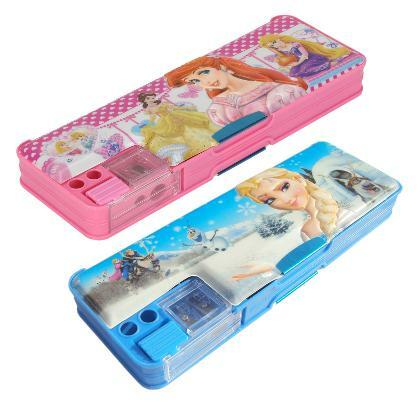 ASERA Featured Combo Pencil Box will interest your child to keep things organized and in place with the attractive color;their favourite Frozen & Disney Princess Cartoon Character and Button Mechanic operated pencil box. The pencil box with multiple compartments and Magnetic Closure;which keep desks neat and organized and it is compact to fit in the backpacks. It is very useful and convenience. You can put pen;coins;or other small things. Mechanical Multi-functional push-button systems to ensure easy and fast usage. This unique box can accommodate all the necessary stationery that your child would need to carry to school with separate slots for Pencil;Rubber;Eraser;Geometric set;Crayons etc.